Looking Back At The BBC's Mid-1960's SHERLOCK HOLMES Series | Warped Factor - Words in the Key of Geek. 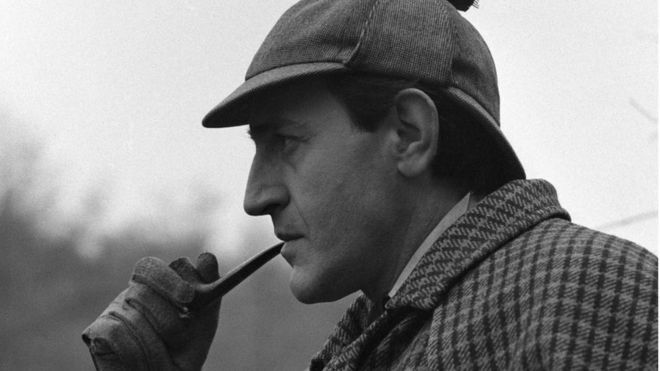 Matthew Kresal dons the deerstalker and looks back at the mid-60s BBC television Sherlock Holmes series. Sherlock Holmes remains the most filmed fictional character of all time. He has been the star of countless film and TV productions, ranging from the silent era all the way up to Benedict Cumberbatch's interpretation. Yet there are Holmes' who seem to fall by the wayside, who don't get quite the attention they deserve. One of them is Douglas Wilmer, who passed away a little under a year ago now, who played the role for a season of BBC adaptations in 1964-65. And what an interesting series it was too. This is in large part because of Wilmer himself. Watching his performance, one is hard put not to think of him as a proto-Jeremy Brett. They have the same air to them, one that comes straight of Doyle's original tales: energetic at times, bored or frustrated at others, a man with an occasional aristocratic arrogance but not beyond sympathy or capable of flashes of humor. Watching Wilmer's Holmes in stories like The Devil's Foot or The Copper Breeches is to witness as good a Holmes as one is likely to see anywhere, with actor and character alike playing across the full spectrum of the role. Wilmer may not be ranked highly in general but anyone who watches this series will likely do so after they see him. Sadly the same can not be said of Nigel Stock as Watson. It isn't entirely Stock's fault, he's one of those fine British character actors who played roles in anything and everything and he does solid work throughout all the episodes. Yet in a way that Wilmer's Holmes makes one think of Brett, Stock's Watson makes one think of Nigel Bruce's famous take on the character: a man frequently out of his depth who seems to be there more for being a good humored fellow than anything else. 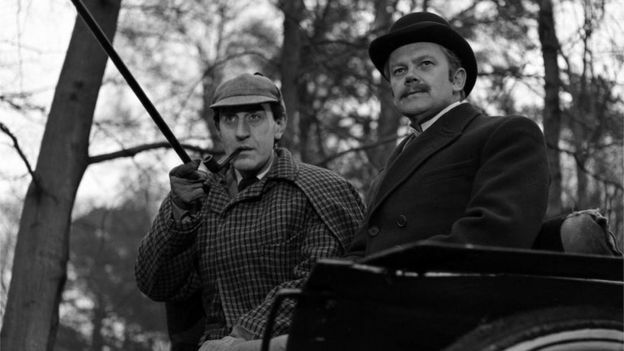 It isn't a bad interpretation of the character by any means but it isn't Doyle's Watson either, which makes it a shame that such a fine Holmes had a Watson that wasn't quite up to scratch. Yet for straying on Watson, the adaptations all tend to be quite faithful to the source material. Charles Augustus Milverton is a perfect example of this, capturing many of the moments and dialogue from the original tale. Other famous tales from the season include The Speckled Band and The Red-Headed League, though the latter suffers (as some of the adaptations do) from the need to add additional scenes to bring them up to running time. Even some of the more obscure stories are adapted, being perhaps the only place one can see adaptations of The Beryl Coronet (which features Brett's first Watson David Burke among the cast) and The Retired Colourman, though both reveal why they are so rarely done. For covering such a wide breath of the Holmes canon alone, the season is worth a watch. The quality of each episode can vary. Those familiar with Patrick Troughton era Doctor Who will recognize the multi-camera, black and white format that is largely studio bound with the occasional exterior film sequence. Yet that isn't at all a bad thing as it tends to lend atmosphere to the episodes when they're at their best, such as The Copper Beeches or Michael Hayes' excellent direction of The Retired Colourman, with the latter in particular being elevated by the quality of the overall product. Some episodes are hindered by their direction, such as The Red-Headed League and The Disappearance of Lady Frances Carfax where it seems as though their respective directors could bring little new to their efforts. Yet even then, they are elevated by often great guest cast members, including Troughton himself, Peter Wyngarde, Barry Jones, Joss Ackland, and a number of other familiar faces from the period. If you can adjust to the production values, you're in for a treat. What is perhaps even more remarkable is that we have virtually the entire season. Having mentioned the Troughton era of Doctor Who above, those with an interest in what might be termed “cult TV” or “archival television” are aware of how little survives from the BBC archives from this period. Yet we have eleven complete episodes of Wilmer's Holmes with two more episodes partially surviving (ironically with ones first half and the others second half). As a result, we have a complete portrait of Wilmer's Holmes and the season as a whole. Which is fortune in many ways. Wilmer ultimately left the show at the end of the season, citing the rushed nature of the production schedule as well as a lack of happiness with the scripts. He would be replaced by Peter Cushing, for whom we have less than half of his season. Yet Wilmer's season, for the faults that mire it at times, still makes for remarkable viewing thanks in part to faithful adaptations and the solid production values for the period. Above all, they stand up thanks to Wilmer's Holmes and live on as a tribute to him as one of the finest Holmes' you have never seen.